Search for fashion tips for men online and you would get majority of the articles written about those with perfect modeling bodies. My instant reaction to it is – How many men out there have such Greek-like physique in reality? For whom are you actually writing it if the majority cannot benefit from it? Trust me, there are rare who are born with the genetics to be blessed with the kind of body you see in the advertisements and read in the articles. You certainly do not need to feel bad about not being one of them because you, my dear friend, are not alone! I can understand it and today I will be talking about you all. This article is for the real you and would give you the fashion tips that won’t be superficial for you to follow. So, continue reading it. It is worth your time and attention! Have you ever been in a situation when you felt that even the belt you are wearing is useless and it does not solve the purpose at all? Result – You are stuck feeling uncomfortable, trying to hold your pants at place by adjusting them with your hands every few minutes and ultimately leaving a bad impression on the person in front of you! Well, to save you from that embarrassment and annoyance, suspenders would be the best solution. They would allow your trousers to fall around your stomach smoothly just like a drape. Always Remember! Everything in your suit should compliment your body structure. If you have a broad face-cut, you would surely not want to wear a shirt with a tiny collar that would ultimately hide underneath your bulgy neck. So, find yourself a brand that manufacture shirts with a collar spread that compliments the size of your face. 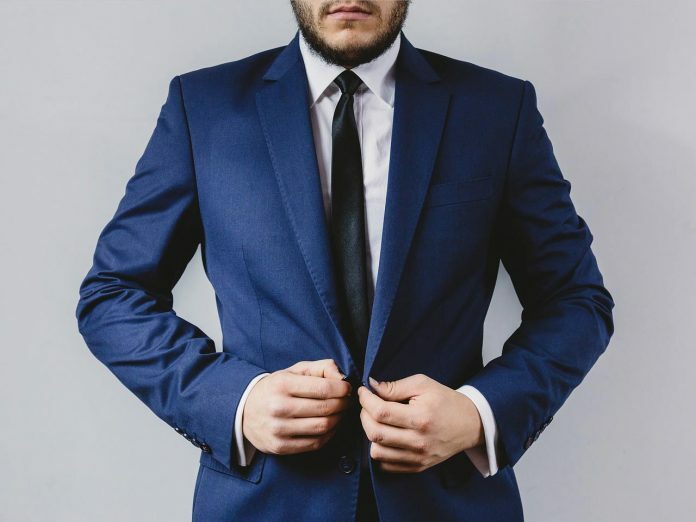 Why am I asking you to wear a spread collar is because it would not only add proportion to your face but would also allow you to wear those classy tie knots. However, make sure that your knot is also tied large otherwise it might end up looking a bit funny. Having a piece of cloth coming flat on your stomach would obviously highlight it and I am sure you would not want them. Trust me! There is no such fashion rule that every collared shirt with long sleeves need to be tucked in your bottoms. The best thing for you is to get your shirts tailor made that suits your body size and shape instead of trying to fit in the readymade apparels. Unless you are wearing a suit or a dress pant, you do not necessarily need to tuck it in. Give your body some breathing space and allow yourself to feel comfortable with your shirt pulled out while pairing it with jeans or chinos! The first impression that generally a person with big body leaves is being lazy. You might have got really shocking expressions from people around you when they discovered that you are rather the most active person they would ever encounter. Well, why don’t you let your looks do the talking? Pair up your outfit with a stylish hat. I have noticed that a hat is one accessory that goes with almost all apparels and it looks much better on people with huge bodies rather than lean people. Besides, by adding up this accessory you would imply to them that you are actually thoughtful about what you wear and you do not take yourself for granted. Being a big man, you should have figured out by now that correct proportion is everything when you choose your accessories. So, ditch the smaller accessories and go for the bigger ones to enhance your look. For instance, if you are looking for a pen to pin up to your pocket then you should get yourself a heavy metallic fountain pen that looks prominent on you. Do not forget your most important accessory – The wrist watch. Choose one with a large dial and broader strap. You might have noticed that following these tips won’t cost you much. It’s all about what makes you feel comfortable and confident. Shop keeping in mind what makes you feel good about yourself! Moz is an innovative Content Writer who has years of experience in content writing and love to write about latest fashion trends. He also works as a freelance content writer for JodhpurTailors - a stop solution for Mens Tailored Suits. In his spare time, Moz loves to try hands on cooking and experimenting on new looks.